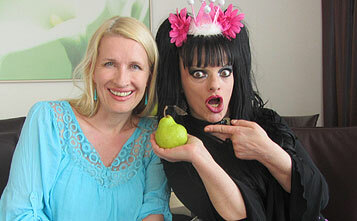 7.07.2012 Nina Hagen was interviewed by Kurier (Courier) and sang in the city park in Vienna, Austria. Nina Hagen "for eight years single". In the Viennese town park Nina Hagen speaks of her faith, her life and her sexuality. The guitar on the back, a pink little crown in the black hair. "I like this because I feel like a small school girl", says the 57-year-old German Rock-Punk-Gospel-Soul-Blues-Tube. Above the leggins there is a spotted minidress. Deep black make-up on eyes, gaudy pink-coloured lips. This is Nina Hagen! Happily and affectionately, like an angel on earth, she hops on her platform soles about the Viennese town park, waves to the homeless, welcomes a veiled woman with "Salem Aleikum" and stops with known psychiatrist Reinhard Haller at Plauscherl. He comes out as a big Nina Hagen fan and asks for a photo. 08.11.2012 Le Mans -France- With Brigitte, Le Forum, Nina Hagen & Band new! 17.11.2012 Tarbes -France- Centre Culturel de la Gespe, Nina Hagen & Band new! 7.07.2012 Нина Хаген дала интервью Курьеру и спела в городском парке в Вене, Австрия.